I came across this picture on a postcard I bought years ago. It reminds me of how much I would love to have a cat (which is impossible, because I live in an apartment and am horribly allergic to cat hairs) to share my love of books. 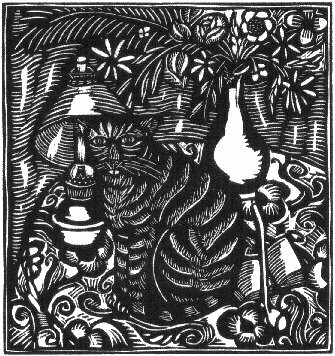 "The cat" in Le Bestiaire ou Cortè d’Orphée, by Guillaume Apollinaire, first published by Deplanche, 1911; illustrated by Raoul Dufy, woodcut, 33.0 x 25.2 cm.